Someone open a window - it's getting warm in here. One of the very few downsides of modern digital music technology is that, obviously, it doesn't automatically deliver the eternally desirable, ear-pleasing warmth of analogue gear. In this walkthrough, we'll show you how to apply a variety of saturating and distorting plugins to a 100% digital mix in order to add beneficial harmonics, warm things up and generally make the whole affair sound convincingly 'analogue'. For much more saturation- and distortion-related tomfoolery, be sure to pick up issue 285 of Future Music, which is on sale now. Step 1: Here's a 128bpm house track. The mix is relatively balanced, but its overall cohesion, tone and weight could be improved with touches of warmth. Let's start with the kick buss. We've loaded Native Instruments' Driver over the group - turning up the Input pushes the two kick layers into the plugin's drive stage. This adds subtle harmonics, gelling the two layers together as one. We pull down the Output knob to compensate for level increase caused by the drive. 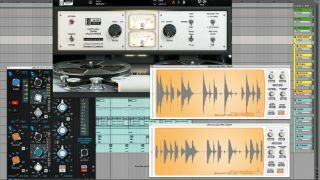 Step 2: To tame the crack of the sharp snare, we apply a liberal dose of tape saturation with u-he's Satin plug-in. This reduces the snare's peak level by roughly 5dB, claiming back mix headroom while adding a touch of fizz and weight. The toms provide weight and groove between the kicks, but the groove is made up of separate samples. Tape saturation, added via FabFilter Saturn, crunches these hits together as one, adding harmonics and levelling the sounds. Step 3: Electronic hi-hats can sound overly bright; distortion will remove digital harshness. Here, the UAD Moog Filter plugin's drive stage is adding grit to these hats. The plugin's filter also rolls off top-end, but we've pulled back the Mix knob to blend this filtered signal with the dry signal. Saturation and distortion can add unwanted rumble, so this is rolled off with EQ. Frequency analysis shows us the extra upper-mid harmonics that our distortion has added. Step 4: Tape saturation from Slate Digital's VTM smoothly glues our drum group together, invisibly chopping off sharp peaks. Then the UAD API Vision Channel Strip's preamp gain is pushed hard. These processes are barely audible, but gently roll off highs, reduce harsh transients and glue things together. Two oscilloscope plug-ins - one on either side of the two drive plugins - show how we've gained headroom and smoothly clipped transients without noticeable artifacts. Step 5: Our synth parts are rather dull and clean. To remedy this, we've added an instance of iZotope's Trash 2 across the synth group. An extreme waveshaping preset applies wild, squealy distortion to the channel, which we can rein in by mixing the dry signal back in, adding top-end fizz in the mix without overpowering the sound's original character. A touch of unique saturation from Kush Audio's Pusher further levels out the synth loop in a harmonically pleasing way. Step 6: To finish off the mix, the UAD Studer A800 is loaded over the master output, emulating the process of running the mix hot to tape. This saturation tames transients in a more musical way than compression or limiting, while adding harmonic weight to the lows of the kick and toms. When A/Bing the original track with the newly-processed version, our various drive stages add subtle glue and punch - with the added bonus of peak and dynamic control.